With this alpha, we want to show how we are maximizing the utility of Ethereum as a secure component in our technical architecture and guarantee that we deliver the best possible performance. To use the alpha, users must understand how to interact with the Ethereum blockchain. However, for future versions of our desktop application, average users will be able to access our service without having any blockchain knowledge at all. For alpha testing, users will need a tool to manage their local Ethereum wallet and navigate to our Ethereum compatible website. Currently, installing an extension on a desktop browser is supported for our alpha. MetaMask is a browser extension you can install on either the Chrome or FireFox browser. Once you have the Chrome or Firefox browser installed on your computer, please install the MetaMask browser extension. After the Metamask installation your account should be unlocked before navigating to the YOSEMITE Alpha website, otherwise alpha functionality will be unavailable. Also please make sure that your Ethereum network is configured to the Rinkeby testnet. Once you have completed your Ethereum wallet setup, it's now time to buy your first asset shares on the YOSEMITE Alpha. Go to http://alpha.yosemiteX.com. dUSD is used by YOSEMITE as a stable (dollar pegged) trading currency. For the alpha, we provide each account with an initial amount of test dUSD. For more information about how dUSD works, please refer to our technical white paper. 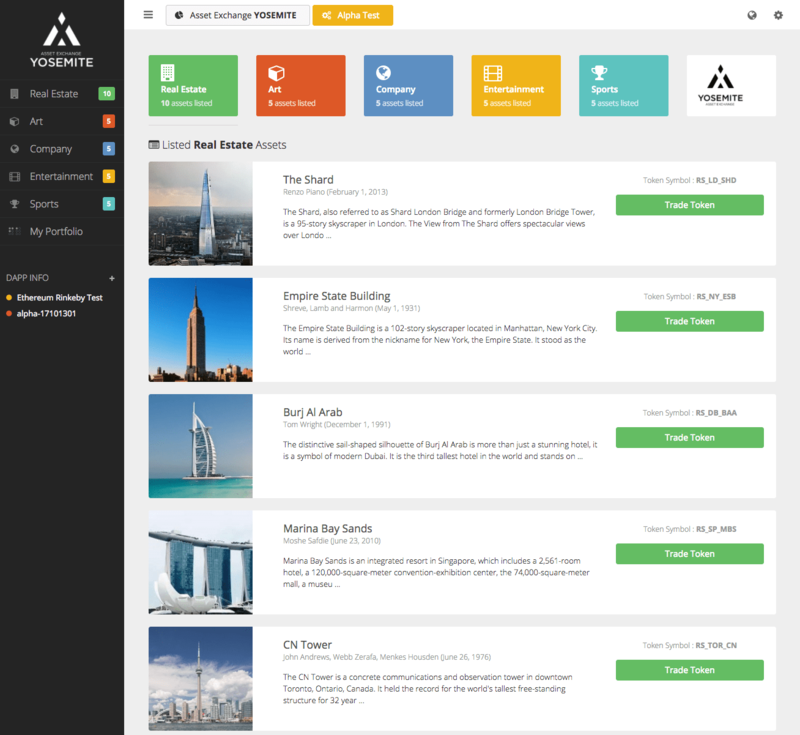 First, navigate to the trading page of an asset (by default the main Real Estate page should load, click one of the properties you would like to trade). Once on an asset trading page, you will automatically see the above popup for depositing $5,000,000 worth of dUSD into your Exchange Service account. To claim your test dUSD, you must click "Request Free dUSD Deposit". Finally, once the request transaction has completed, click "Close". Note: Your dUSD will not automatically show up in the Metamask interface. However, it can be checked within the YOSEMITE Alpha. You can check your current Exchange Account balances on each trading page located below the main asset data sheet. Now that you have $5M in your exchange account, find an asset you want to trade by navigating to its trading page. Once on your chosen asset's trading page, scroll down to the buy/sell box below the price history chart (as seen in the above image). To place a limit buy order, enter the amount of shares you want at your preferred price (some price below the current market price). 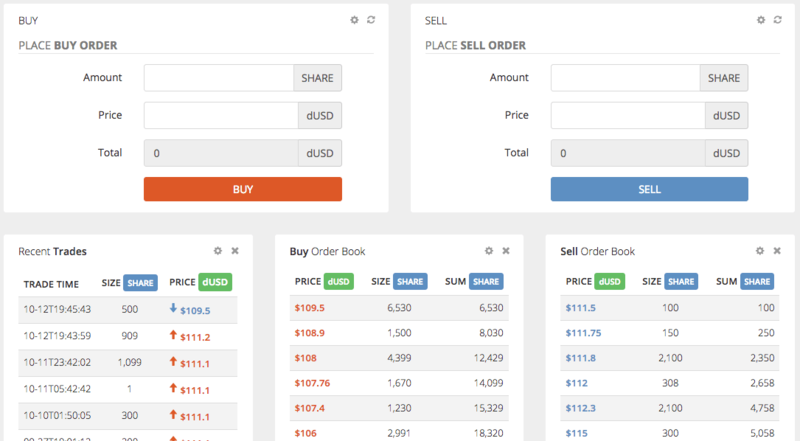 Or, if you want to take an existing sell order from someone, you can simply click one of the orders from the "Sell Order Book". 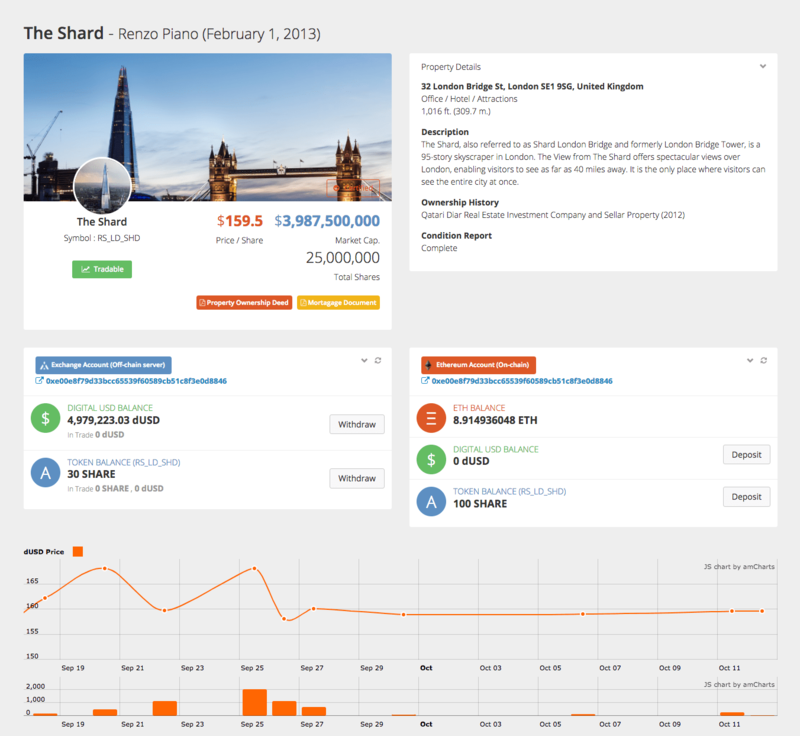 This acts as a market buy and will automatically fill the "BUY" input fields with the corresponding price and volume information. As per usual market buy behavior, your order will be filled by the lowest priced sell orders first until your order has been completed. If there is any remaining buy volume left over from your order, it will be placed on the "Buy Order Book" at the price you chose. When your buy order looks correct, click the "BUY" button. After double checking that your order is correct, click "Submit Buy Order". The subsequent window will require you to digitally sign the transaction; confirming that this transaction has been signed by no one else but you. With the help of cryptographic magic, your transaction on YOSEMITE can only be made by your local Ethereum account credentials. Note: In the future, we will provide a public method whereby any 3rd party can easily verify the validity and correctness of all YOSEMITE transactions. For the technical aspects of transaction validation and security, please refer to our technical white paper. All trading funds are kept in the YOSEMITE Exchange Vault smart contract and all trading operations are processed off-chain for high performance. However, every operation is digitally signed with an Ethereum account (either by the user or by the trading server) to ensure transaction security, immutability, and accuracy. At any time a user may withdrawal funds from the Exchange Vault contract into their own Ethereum account. These funds will no longer be available for trading (until they are deposited into the vault contract once again). Because withdrawn funds are no longer locked in the Exchange Vault contract, they become fully controlled by the user to be used on the wider Ethereum network like any other crypto token. 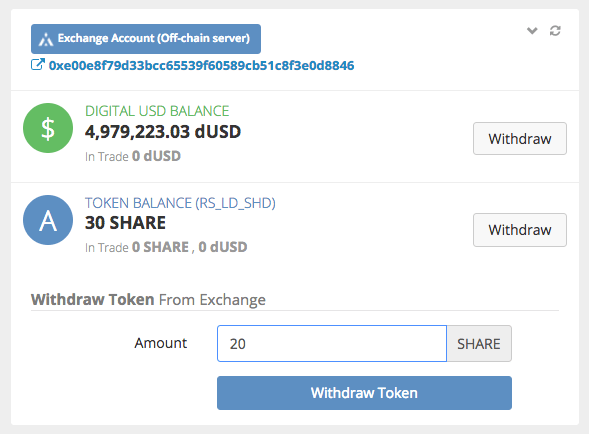 In the Exchange Account section of the asset trading page, click "Withdrawal" for either dUSD or your newly purchased asset tokens. In the resulting popup field, type the amount you wish to withdrawal and click "Withdrawal Token". Next, verify the withdrawal information by clicking "Request dUSD Withdrawal"
Like all other user actions you must sign this transaction with your Ethereum account. All of the withdrawal settlement data is cryptographically verified by the client application and a link to the proof data is provided. To complete the withdrawal, click the "Confirm Withdrawal" button, and sign this confirmation. Wait for the withdrawal settlement transaction to complete. You can check the status of this transaction on the 3rd party blockchain explorer service Etherscan by clicking the "Pending Ethereum Transaction" link provided. If you see your transaction completed on Etherscan, you can be confident that your transaction has been successfully broadcasted to the Ethereum public blockchain. Finally, once the withdrawal has completed click "Close". You can now see that your withdrawal has moved from your Exchange Account to your Ethereum Account. Note: This withdrawal is an on-chain Ethereum transaction which you didn't pay gas for! We call this type of transaction a "delegated" transaction. whereby the user allows the YOSEMITE service to act on their behalf by digitally signing their actions. The end result is that users don't need to pay gas fees for their actions but instead pay fees in dUSD. "Delegated" transactions are used frequently on the YOSEMITE platform in instance where there is a need for both blockchain security and simple user interaction. Congratulations! You have just learned the basic operations of the YOSEMITE Alpha. Feel free to browse through all of the assets available and continue trading with other testers! We will update the alpha periodically (along with this guide), so please check back often. We're always happy to get feedback and answer questions. The assets listed on the Asset Exchange YOSEMITE Alpha are for illustration purposes only. Asset Exchange YOSEMITE does not in any way own or profit from these assets or their use as illustrations of the Alpha’s capabilities.